Vegan Chocolate Chip Maple PB Swirl Brownies – So long 2014!! – Live Kind. Eat Kind. 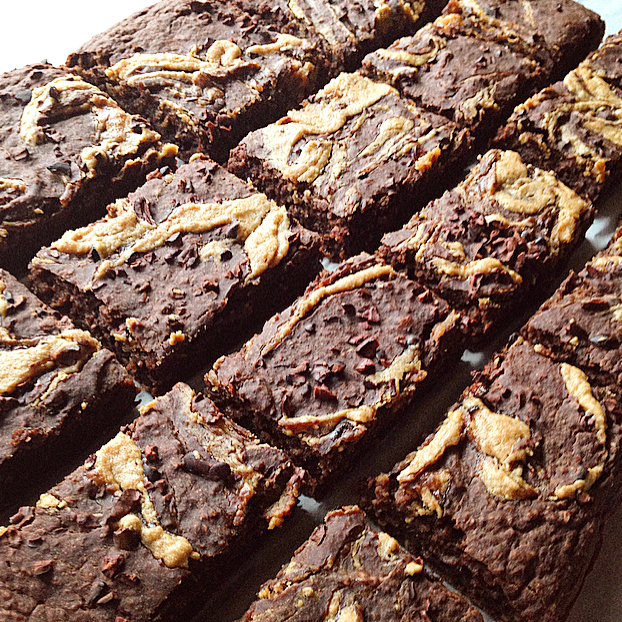 Vegan Chocolate Chip Maple PB Swirl Brownies – So long 2014!! Wow, I cannot believe it is the last day of the year! 2014 has brought so many unexpected blessings to my family. I cannot even begin to thank God enough for how faithful He is, and all of the beauty He continues to weave through my life. I was able to spend another year watching my daughter grow into a happy, healthy, friendly, sassy, kind-hearted, compassionate, joyful little human. I fell even more in love with my precious husband, who continues to grow into a man of deep rooted integrity. I have never felt love like I do from that man. I have had the pure joy of connecting with countless of you incredible people from all around the world who share similar passions and outlooks on life and the way we live it, gaining so much inspiration from each one of you. I am excited and optimistic about whatever God wills for my life in this new year! I think the best two words to sum up how I feel about 2015 are OPEN and GRATEFUL – I am 100% open to whatever adventures God brings our way and 100% grateful for both the good and bad times to come. This morning I got in my kitchen and decided to whip up a delicious treat for New Years Eve tonight. The ingredients are simple and wholesome! I chose to omit the use of oil to keep it lower in fat, but kept it FULL of delicious rich flavor. The texture is fudgey and creamy (my two favorites!). These are best made a few hours before serving, and honestly I like them even better the next day! Combine first 6 ingredients in food processor and blend well. Dump into a separate bowl. Add the next 6 ingredients (minus cacao nibs and the 3 tbsp PB and 3 tbsp maple for swirling) – blend well. Combine wet and dry ingredients. Line your pan with parchment paper and pour it in/spread it. Mix your remaining PB and maple and spoon in top, then swirl with a butter knife. Sprinkle on cacao nibs. Bake for 25-30 minutes, or until toothpick comes out clean. I like them best after they have cooled in the fridge! I sincerely hope your year has been BLESSED, and I pray that 2015 is a year of great things for you! Please know, if you’re reading this, I am grateful for you. God bless you guys! Thanks girl!! Happy New Year! Those looks so doggone good! Thanks so much! They are definitely one of my favorite brownies I’ve made. Happy New Years to you Mariah! Haha thanks so much!! Might as well kick it off with a bang! 😊 Happy New Year to you! What size pan did you use? Thanks! Is it possible to swap out the Vitacost flour for coconut or oat flour? Hey there Sarah, oh man I just made this the other day and wow! My wife and our friend loved it. And so did I, thank you do much, can’t wait to try your other recipes.